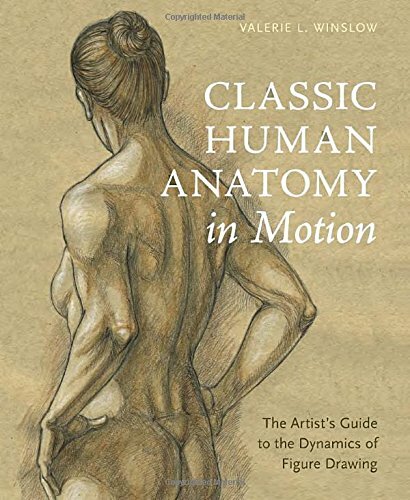 Classic Human Anatomy in Motion is a wonderful instructional book that complements author Valerie L. Winslow's first book Classic Human Anatomy: The Artist's Guide to Form, Function, and Movement which I think is one of the better anatomy books around. While her initial book focuses on more technical parts of the human anatomy, such as bone and muscle structure, this book goes further and talk about how those bones and muscles actually move and what to look out for when drawing them. There are some overlapping content but they serve as reference to reinforce the knowledge from the first book. The example illustrations included are drawn very clearly with proper labels and descriptions. There are schematics as well as toned figure drawing. Speaking of which, this book is most suitable for those into figure drawing, those who want to draw posed figures rather than figures in static postures. For the first book, the section on posed figure is lacking and now we have a whole book dedicated to that. In addition to showing the illustrations, the text explains in great detail about how the body and the muscles work when in certain positions. Like how the muscles stretch and which one stretches and how they look when stretched. The illustrated examples show different angles of the mentioned body parts but of course is not able to cover all the different angles. So that's where the understanding of the muscles underneath is important. You can use that same knowledge to understand what you see in reference photos that you may find online or when you're drawing from life. I would highly recommend this to beginner and advanced artists who are into figurative art. It's an excellent reference on anatomy. Be sure to get the first book too if you have not.